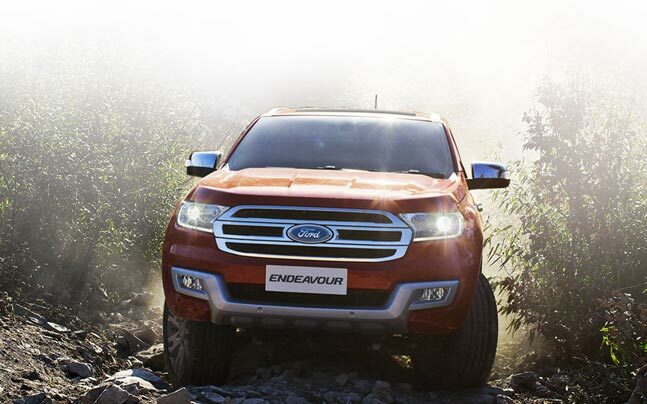 The 2016 Ford Endeavour is based on Ford’s T6 platform and retains the Hulk-like personality along with the long stance. The front-end sports a massive chrome grille with projector head-lamps and DRLs. The bold bumper design comprises a very prominent silver skid plate that extends to house the LED fog-lamps as well. Ford is offering two engine variants: the 3.2- and 2.2-litre Duratorq with just two trims, Trend and Titanium. The 2.2 TDCi is available in Trend 2WD/4WD manual or 2WD automatic and Titanium 2WD automatic. The 3.2 TDCi is only available in 4WD automatic in Trend or Titanium. The 2.2 litre TDCi develops 157bhp, which brings in at a reasonable 3200rpm. Torque is great at 385Nm. The 3.2-litre monster churns out 196bhp. The manual gearbox is a 6 speed, and so is the AT (only available on the 3.2-litre), which is the 6R80 autobox from the new generation of Ford’s F-Series pickups in the US. The cabin is brilliant too: with bucket seats in the front, LED lamps, multi-information display, remote key entry, power windows with one touch and anti-pinch action, and rear parking sensors. It also gets voice control functionality on steering wheel, rain sensing viper, dual-zone AC-automatic climate control, cruise control, power folding 3rd row seat, terrain management system, and more. We will have to wait and watch what the all new Toyota Fortuner has to offer. Sunset Red, Golden Bronze, Moondust Silver, Panther Black, Diamond White, Smoke Grey. Ex showroom price in Calicut, Kerala ?